Teotihuacan, the largest city in Mesoamerica during the Classic period, developed a complex urban civilization. However, no written histories of Teotihuacan are known, and no true writing system is apparent. Teotihuacan's artistic tradition used pictorial forms of visual communication rather than glyphic writing and Teotihuacan art incorporates standardized glyphic elements (Kubler 1967, Langley 1988). Even though the Teotihuacanos were familiar with the writing of other regions, their system does not follow the sequence and glyphic conventions of depiction seen in the Zapotec and the Maya regions. Teotihuacan has to be reconstructed almost entirely on the basis of its archaeology. One reason why many aspects of Teotihuacan remain poorly understood is the fact that a large portion of Teotihuacan remains unexcavated (Cabrera, et al. 1991:77). The interpretation of the art, iconography and symbolism at Teotihuacan has remained elusive, or, where proposed, often there are conflicting interpretations. Interpretation of art influences contemporary understandings of prehistoric societies and cultures. Accurate understanding of the mural art of Teotihuacan is integral to a broad understanding of one of the most influential cultural centers in Mesoamerica. This paper focuses on issues related to the assumptions and validity of mural art interpretation. First, to provide some context for the discussion, I briefly describe Teotihuacan mural art, discuss the current understanding of mural chronology, and outline the history of its study. I then consider issues relating to interpretation. A discussion of the full range of specific mural interpretations would be an enormous task, and is unnecessary to address the issues herein. I decided to discuss a specific theme, that of the interpretation of religion, to illustrates questions about accuracy of interpretations. In the final major section I discuss the interpretation of religious themes, first by focusing on broad religious interpretations, then by presenting specific elements and categories of the art with religious interpretations. One of the impressive features of Teotihuacan is the polychrome mural art, some surprisingly well preserved. The mural art constitutes a significant data source with respect to Teotihuacan culture. Mural painting and ceramics are the principal surviving art forms at Teotihuacan, and murals are an important aspect of its architecture. The great number of known murals at Teotihuacan is illustrative of their importance. Most of the murals were painted on a plaster medium, a medium with good preservation, with a true fresco technique (Littmann 1973:175). Due to their greater preservation, paintings from lower walls are better known. Teotihuacan mural art is characterizable as pictographic visual communication. There is a great diversity in the complexity and kinds of signs used in the mural art, varying from naturalistic to geometrical, to abstract. Depictions include quetzals, jaguars, doves, fish, felines, serpents, shelled animals, shells, sea creatures, water lilies, and seeds. Flowers, shells, and feathers abound, as does the depiction of humans, animals, and compound forms, while utilitarian objects and domestic scenes are rare (Langley 1986:31). The art includes stylized representations based on living organisms found in the natural world. Anthropomorphs and animals can be composites and there are also compound forms with no actual correspondence to nature. Many signs are surrounded by concentric borders and create the effect of cartouches. Some pictographic signs represent natural objects and function nominatively while others are associated with activities. In the Temple of Agriculture mural small human figures are depicted presenting items to two composite mountain-platform forms which are anthropomorphized with earplugs, necklaces and nose plugs. Settings such as this have been interpreted as ceremonial and ritualistic. Other murals have a playful quality. Tepantitla recreation in the National Museum of Anthropolgy, Mexico, D.F. Sound scrolls, from simple spirals to complex compound scrolls with bordering and enclosed signs, emanate from beings and natural objects, including shells. Streaming motifs, decorated like the sound scrolls, emanate from the mouths of creatures and fall from the hands of people and anthropomorphic forms. Insignia such as rattles, bags, standards, headdresses and shields are used in the composition of anthropomorphic forms. Individual attributes such as rank, function, and affiliation may have been recorded, and persons and places were probably named (Langley 1986:174). Although early and late murals can be distinguished, a refined chronological sequence for the murals does not exist (LaGamma 1991:275). Several authors offer varying dates for the murals. Lombardo (1996) recently offered a five-phase stylistic sequence. 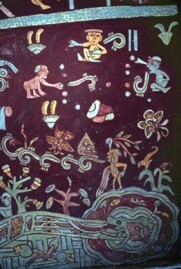 According to Lombardo (1996:5), the earliest known mural painting in Mesoamerica occurs after 100 A.D. Early mural art was decorative and geometric. 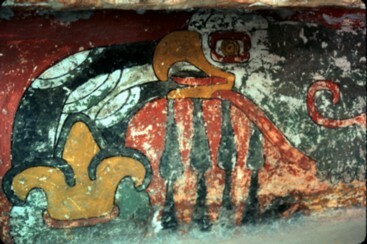 In general, the murals rendered in red colors are considered older than the polychrome murals (Cabrera 1995a:xxviii). Miller (1973:12) writes that mural painting began at least as early as 200-300 A.D. and continued until about 650 A.D., with the majority of mural art dating from 450 to 650. LaGamma (1991:275) states that mural painting began around A.D. 250 and reached its major florescence during the period 600-750 A.D. Concentric circles and marine shells painted on the facade of the Feathered Serpent pyramid probable date to between 100-200 A.D. (López, et al., 1991:93, Cabrera 1995b:7). Of the great quantity of murals so far discovered at Teotihuacan a few are approximately dated by inference from the dating of the buildings where they are found (Cabrera 1995a:xxvii), although the majority of the buildings do not have a precise date (Cabrera 1992:113). Miller (1973:37) thinks the murals and walls were made at approximately the same time; that the murals were created at the time of construction, that the architecture is patterned to display the paintings, and that the paintings give meaning to the architecture. On occasion murals were plastered over and replaced with new paintings (Miller 1973:37). 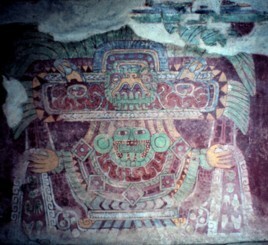 The murals in the Patio Blanco of Atetelco are dated to 350-450 A.D., and the other Atetelco murals dated to between 450 and 650 A.D. (Cabrera 1995a:xxvii). 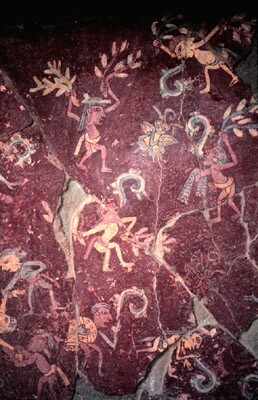 Murals were first excavated by Batres in 1883 (Miller 1973:13). The discovery of the dynamic Tepantitla murals in 1942 stimulated renewed interest in the mural art (Miller 1973:13). Excavations were started at Tetitla and Zacuala in 1944, and at Atetelco in 1945 (Miller 1973:13). Villagra restored murals at Atetelco (Villagra 1951). Séjourné (1959, 1966) studied both Tetitla and Zacuala. 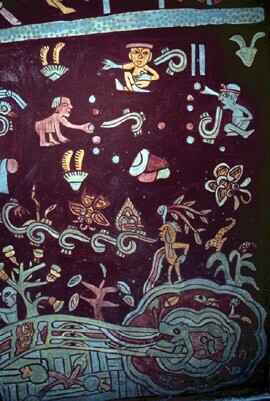 During the 1960s numerous new murals were uncovered by the excavation and restoration programs of the Instituto Nacional de Antropología e Historia (Miller 1973:13). The newly discovered murals resulted in numerous mural studies. Von Winning, beginning in 1946, studied and reported on specific depictions, dripping water, shell designs, building representations, figurines, the reptile eye glyph, and he offered interpretations. He approached the art by examining motifs for detailed comparative study (Kubler 1967:3, von Winning 1987). Séjourné (1959, 1966) produced several works on Teotihuacan art and architecture containing very useful drawings and photographs. Her "psycho-historical method" (Kubler 1967:3) focused on attempting to find a unitary key to interpretation of cultural symbolism. Pasztory characterized Séjournés view as mystical and meditative. Caso studied Teotihuacan glyphs (1942, 1958-59, 1961) and, in particular, addressed glyphs related to calendars (1937, 1967). In 1966 he published an article on the gods and symbols at Teotihuacan. Kubler (1967), in a brief article, attempted to define iconographic relationships in Teotihuacan art, describing configurations and their internal relationships. Kubler characterized Teotihuacan iconography as word pictures and used a linguistic model to consider the relationships of pictographic elements. He reported 55 images of life forms and 50 glyph signs. 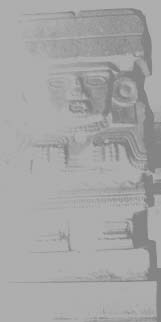 He stated that most of the signs also occur in Vera Cruz, at Monte Albán, or at Xochicalco, that some appear at Tikal and Kaminaljuyu, and that some signs are peculiar to Teotihuacan alone. In Kublers view the artists at Teotihuacan were "less interested in recording appearances than in combining and compounding associative meanings in a quest for viable forms of writing" (Kubler 1967:5). 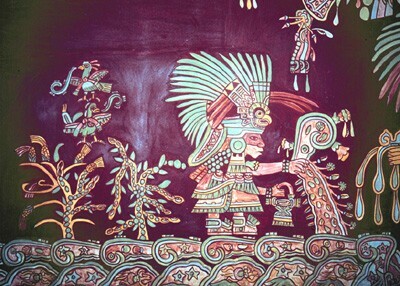 C. Millon, in an article on the history of Teotihuacan mural art (1972:2), characterized the "more than 200 mural paintings from 40 structures" then known as "a very small sample of the paintings." She wrote (1972:1), "To try to understand the history and way of life of Teotihuacan without careful study of the mural painting would be equivalent to study of the Maya area without its sculptures or its codices." She also pointed out the size and complexity of the city, the diverse functions of painted structures, the possible great variation (ethnically, in status, and in occupations) in art patrons, the public and private settings of the art, and the possible differences in belief systems (C. Millon 1972:2). She noted that mode of expression through time changed "radically," and concluded "whether its import changed as well we may never know." She (1973) also studied the "tasseled headdress" and offered the interpretation that political and religious leadership were united. Authors disagree on the interpretations of Teotihuacan art, on the degree of decipherment that is possible, and on methods. For example, a glyph with dots (interpretable as numerals at Teotihuacan) is interpreted as a heart with blood by Séjourné, as drops of water by Von Winning, and as a calendar sign by Caso (1967:175). More examples of contrariety in interpretation are presented in the discussions below. "No es que estemos en contra de hacer interpretaciones, pero siempre y cuando éstas no pertenezcan al mundo de la fantasía. Sin duda, la obligación de todo investigador es presentar una tesis interpretativa al finalizar sus exploraciones, más debe de proceder con cautela porque una afirmación equívocada puede retrasar las investigaciones indefinidamente." Various sciences, their diverse schools of thought, and the diverse areas of the humanities can have distinct views of art. Morelos (1991:238) views five orientations in the investigation of prehispanic art: 1.) the romantic or idealistic view, which considers the content as elevated spiritual material of a religious, magical or mythical nature, 2.) studies that pretend that imaginative deductions and sterile theories are "absolute truths," 3.) historical studies that remove exceptional cultural success from its socioeconomic context, 4.) views that attempt to explain, rather than catalog, isolated aspects grouped by an iconographic criterion, and 5.) studies that lack a fundamental methodology. Interpretation of Teotihuacan mural art certainly presents difficulties. Symbols, and even naturalistic depictions, may or may not have particular meanings. Phonetic or logographic readings and rules of syntax of Teotihuacan graphic representation have not been elucidated. At Teotihuacan, without a knowledge of the language(s) spoken, the glyphs cannot be readily subjected to a philological test and metaphorical understanding is entirely lacking. The lack of linguistic knowledge is a major impediment to the interpretation of the notation (Langley 1991:295). With iconographic analysis, rather than epigraphy, there are no certain literal meanings. There is a significant variation in the rendering of most signs, even though the signs have prototypical forms (Langley 1986:17). The time depth of sign usage is uncertain, and continuity of usage can be unclear. As seen above, in the previous section, mural chronology is not refined. Without a reliable chronology comparisons of motifs in different murals lack temporal determinations. Even if temporal relationships were known, the question, "Can context of a motif in one mural be used to determine meaning in another mural?" remains (to say nothing of its presentation in other media, sites or cultures). I have noticed a general tendency in mural studies (and Mesoamerican art studies generally) of treating the mural art as though it is a unified whole, rather than myriad artworks by numerous artists spanning many centuries. While there are components of the art that obviously adhere to definable conventions, motifs may be used in contexts that are not part of a symbolic system. There is no certain criterion to delimit these domains. "although the individual signs may be drawn from nature, it is often difficult to determine even the literal meaning of compounds. This is in part due to the uncertainty about what precisely the artist wished to invoke by certain pictographic images ... the messages they are intended to express often remain obscure. (1986:41-42). Cross-cultural comparisons and analogies within Mesoamerica are possible. The cultures of Mesoamerica shared a mutual history, a calendar, and, to a degree, "certain basic religious and mythological beliefs" (Pasztory 1976:110), although I question the accuracy of contemporary interpretations of those beliefs. Prior to Teotihuacan art, Olmec artistic representations, elements of which are recognizable in Teotihuacan murals (Lombardo 1996:13-15), evidenced conventionalized ideographic elements over a wide geographic region. And broad continuities are seen between Teotihuacan and contemporaneous groups, as well as with Aztec symbolism. However, this approach has limitations. The direct historical approach to interpretation of Teotihuacan art by analogy with Aztec art began before the temporal gap between the artwork of the two cultures (at least 700 years) was fully appreciated. In her interpretation of some Teotihuacan murals, Séjourné used analogies to interpretations of Aztec art. 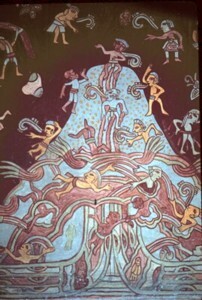 Séjourné (1959) viewed Teotihuacan as the place of origin of Nahuatl religion and its art as "una escritura santa," and she interpreted anthropomorphic figures in the mural art as the nearest perceived equivalent numen in Aztec art (1959:30). For example, Séjourné equated a female representation at Teotihuacan with the Aztec representation of Chantico (1966:152). Some very broad issues and theoretical problems came to mind while I read the mural literature. Fundamental questions seem to have been ignored in the study of Teotihuacan mural art, and unstated theoretical assumptions seem prevalent. I believe it is valid to assume that the world view of a society, whether those views are religious, magical, mythical, natural, scientific or combinations of these, will be inherently evidenced, at least to some extent, in its symbolic system. Contrarily, I regard as invalid the assumptions that only one world view exists in a society, that world views are consistent over the temporal span of a society, or that one or the other of the possible world views (i.e. religious) is inherently present. Before, or as a part of, interpreting a societys art the following fundamental questions need to be addressed. To what extent was the symbolic system interrelated with particular arenas of the social system, with the arts, entertainment, social life, production, politics, religions, or other arenas? What evidence, outside of the interpretation itself, supports the relationships and meanings posited? Different groups in a society may have entirely distinct world views, especially in a large and complex urban civilization such as Teotihuacan. Did the symbolic system serve to reproduce the philosophy, customs, beliefs, social norms and ideologies of the society at large or particular groups, and if so how extensively and/or exclusively? Does all the art adhere to a symbolic system, or is only a portion of the art systematic? Is the art, and its components, the product of individual consumers and/or artists taste in decoration, or is it governed by a communal aesthetic? Who controlled the content of the art? In my view, the interpretations discussed below disregard these questions and theoretical issues. At the opposite end of the spectrum, that is, the specific, I also question certain interpretations and their underlying assumptions. For example, some quite simple geometric decorations have been interpreted as inherently meaningful. As Cabrera (1995d:46) reports, green circles have been interpreted as "chalchihuites, símbolos de belleza, los objetos preciosos, el campo verde, la abundancia, la fertilidad." Also Cabrera (1995d:47) himself interprets circular red drawings with fringes (in Portico 2, Conjunto Plaza Oeste) as shields which warriors carry, and triangles in a series on either side of parallel lines as "macanas o armas militares" (clubs), in part because they are opposite the portico with the fringed circles (1995d:48). While some of these interpretations might be true, geometric forms can also simply be decorative. In the case of these examples, the motifs lack contextual support for the interpretations. As in these examples, interpretations often assume that complex meaning is inherent in the most basic motifs, or that every design, even the most ubiquitous of geometric forms, is part of a symbolic system. This case, that of assumptions in interpretation of simple geometric forms, exemplifies a more complex problem of assumptions when considered in relation to more complex motifs. The following discussion focuses on the motifs and categories that have been interpreted as religious. I first present some general interpretations by diverse writers, and then discuss specific categories and elements. When they are offered in the literature, and this is not always the case, I include the rationales for the interpretations. My purpose is to present sufficient material to assess the religious interpretation. The various interpretations are not consistent; the authors are not always in agreement. This variability certainly justifies questions about the accuracy of the interpretations. Several authors make very broad assumptions about religion and Teotihuacan. "was a sacred place of enormous prestige, whose religion must have encompassed a belief system that transcended ethnic, linguistic, and regional ties." (1992:378). "...religion undoubtedly was of enormous importance throughout the life of the city...."
"La proposición para entender el pensamiento cosmogónico en la etapa teotihuanaca que aquí se aplica, se basa en la consideración que desde la fase inicial todas las culturas prehispánicas compartían un concepto mítico acorde con una religión politeísta que deificaba a todo elemento natural." "For more than a century, Teotihuacans images and icons have been the object of scholarly scrutiny. Yet major questions about the nature of the image system, the divinities portrayed, and the uses of art at this great metropolis remain unanswered." Kubler (1967:5-6) interpreted the mural scenes at Zacuala as strongly suggesting litany and liturgy, including the names of deities, recital of the powers of the deity, and worshipers petitions. He suggested (1967:6) that the murals designate "complex liturgical comparisons, where powers, forces, and presences are evoked in metaphors or images", and concluded (1967:12) that "every mural or decorated vessel is a prayer exalting the elements of nature." "...we can be confident that emblems of various kinds were widely used in the culture, that sign usage included the arrangement of signs in linear sequences characteristic of verbal texts, and that the sign system was capable of signifying concepts such as war, sacrifice, and, probably, ritual events." 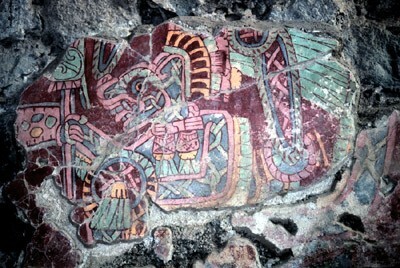 "In considering all the analogies cited and the imagery of the Teotihuacan insignia there seems no doubt that they may be comprehended as emblems of military leadership related to the Storm God, implying that this deity was, inter alia, the patron of the warriors who fought under his insignia, much as the Crusaders a few centuries later sailed for the Holy Land under the banners of Christ." "...nature, fertility, sacrifice, and war, ... are seen as a collective enterprise in which humans, animals, and even gods are depicted..." (1992:136). "Teotihuacan images suggest a neutral, impersonal world inhabited by largely benevolent deities and by an anonymous elite preoccupied with the proper performance of ritual." (1992:137). Interpretations of specific elements or scenes are easier to analyze than broad and sweeping general interpretations. They are also the foundation of broader interpretation (or, at least, they should be) and, if unjustified, raise questions about broader interpretations. In the remainder of this section I focus on specific interpretations. "Los circulos concéntricos o anillos, por su permanencia en casi todas las culturas posteriores del Altiplano mexicano, se asume que representan cuentas, joyas, chalchihuites, que por asociación se les identifica con la función calificativa de lo precioso, lo valioso. Cuando son verdes y semejan jade o serpentina --piedras que desde el Preclásico se utilizan en rituales y cultos-- se relacionan con el agua, con las gotas de lluvia y por lo tanto con la fertilidad." In this case both of the interpretations of Aztec art are seen as having a continuity of meaning spanning over two millennia. "In the Temple of Agriculture mural, the goddess is depicted as monumental mountain-like forms in relation to her worshippers." "Ésta se ha llamado de las ofrendas porque las acciones ahí representadas sugieron que los personajes, sentados y de pie, ofrecen distinctos dones de la tierra a dos grandes imágenes que se han interpretado como deidades, como braseros con flamas, y también como construcciones en cuyo interior hay un sahumerio con flamas. Los supuestos ofrendantes llevan palomas, maiz, y otros objetos, y entonan oraciones o cantos según se apreciaba por las vírgulas del lenguaje que salían de sus bocas." "...al centro el la parte alta una especie de tocado, que recuerda a otros que se miran en varios imagenes teotihuanacas, y que pudieron simbolizar la imagen de una deidad..."
"the hypothesis that many frontal figures are cult images or supernatural beings allows us to suppose that the same figures, when shown in profile ... represent human celebrants, or priests, or impersonators." "Hay varias figuras antropomorfias que llevan los mismos atributos o emblemas que characterizan a las deidades, aunque es fácil distinguirlas de ellas, por estar representadas de perfil y de cuerpo entero, a la vez que por encontrarlas ejerciendo algún ritual en torno a la deidad que representa de frente o como un busto solo." "En una composición simétrica, se muestran de perfil dos sacerdotes que se dirigen hacia un pequeno altar sobre el que se levanta un disco solar." "Depictions of Teotihuacan deities and priests are distinguished by a large volute emanating from the mouth (speech or chant scrolls) and by open hands casting offerings." "A primary Teotihuacan symbol is the divine hand from which water, seeds, jades, or other gifts flow. This theme is ... evident in ... various abstract and metaphoric symbols painted in repeating series on polychrome mural panels. Such images are positive reinforcements: they emphasize the beneficial aspects of gods, nature, and elites, and thus, presumably, encourage an easy adherence to the norms and traditions of society." "Images of natural forms organized around a center are easier to associate with a deity or an anthropomorphic being when a face is included in the composition. The face suggests an expression of consciousness, a mind --or will-- that elevates the otherwise blind natural forces operating through the medallion to the level of intentional behavior." Ostrowitz (1991:263) also suggested that elements in murals that seem to float are supernaturals. This conclusion apparently assumes that elements in Teotihuacan art are subject to the physical law of gravity. "Because the portrayal of nature by Teotihuacan artists is persistently organized according to particular canons of representation, the paintings contain a certain objectivity, or actual existence in a distinct but credible reality. "Certain free-floating medallions in this painted world, unfettered by the constraint of gravity, may constitute key structures that signify the presence of a supernatural being....beings operating outside the laws of nature, ones defying gravity..."
"The Great Goddess was one of the most powerful Teotihuacan deities, perhaps for a time the most powerful. Like the Storm God she manifested herself variously in different roles and different contexts. It is more accurate to speak of a Great Goddess complex. We do not know to what degree her different personalities may have been regarded as distinct entities." "Both the Storm God and the Great Goddess appear to have military or destructive aspects, and other deities, including one wearing an owl pendant, may have been related to war." "The Great Goddesss facelessness in so many representations --in some instances her face is concealed by a mask and in others she is represented only by a headdress-- allows her to display an especially wide range of aspects. 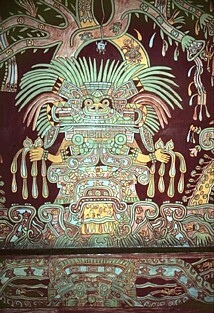 In other murals the Great Goddess displays the jaguars ferocious teeth, and her hands are replaced by claws. Her innate flexibility would enable her to exchange her mask for a jaguar face, and the jaguar could be seen as a surrogate for a particular aspect of the Great Goddess." "a goddess of earthly waters, a patroness of warfare who requires sacrifices, mother of the gods, and the fertile mountain from which all things come." The category "processional figures" as the name implies, has been interpreted as religious. Seler interpreted processional figures as priests in 1915 (Pasztory 1976:113). Pasztory (1976:112) interpreted three kinds of processional figures, warriors (figures carrying weapons), priests (those carrying bags), and gods (human-animal figures). Pasztorys (1976:113) distinguishes a priest from a god as "clearly human rather than a grotesque or composite supernatural," and by the incense bag they carry "which serves ... to indicate that the figure is engaged in ritual activity." The streams flowing from the hands of priests or from the objects they carry are interpreted as identifying "the nature of the deity being worshipped or the ritual being enacted" (Pasztory 1976:115). The processional profile figures include both humans and animals, sometimes of anthropomorphic appearance (Miller 1973:19-20). Séjourné interpreted the jaguar and personage murals in the main patio of Tetitla as symbolizing the realization of a spiritual journey, with the jaguars evoking the itinerary that allows penetration to a spiritual state. "The images evoke a terrestrial paradise through the depiction of waters teeming with marine life, a land of fruit- and flower-bearing plants, and mythical birds, canines, and felines." (Pasztory 1992:137). "The bearers in the Tepantitla mural have decorated streams flowing from their hand. The green dots in the streams are called "jades" by Pasztory (1976:118). Like Chalchihuitlicue, the Teotihuacan deity is goddess of earthly waters that gush forth from the mountain over which she presides in the Tepantitla mural.... Like Itzapapalotl, the great Goddess is a patroness of warfare; she assumes a butterfly guise and demands sacrifices, both locally and in distant lands. Excepting a few earlier papers, Teotihuacan mural art has received significant study for only half a century. The authors presenting interpretations of the art often disagree about meanings. The variation in mural interpretation illustrates that the meanings and identifications of motifs and scenes are debated, that a consensus about the meaning of the mural art is lacking. While differing on specifics, most authors accept a religious interpretation for many elements of the mural art. I question whether evidence supports this broad interpretation. I find, instead, an often unstated a priori assumption that the subject matter is religious, and that religion was important in Teotihuacan society. Broad analogies with Aztec ethnohistorical information have played a role in mural interpretation. Reliance on ethnohistorical information about Aztec society introduces, to a degree, contact period Spanish perceptions into the interpretations. The Spanish ethnohistorical documents interpreted many aspects of Aztec culture as religious, and these interpretations have been applied to Teotihuacan. This aspect of interpretation, use of ethnographic data in developing analogies, introduces another area of inquiry (one I have not discussed herein), the accuracy of the Spanish interpretation of Aztec culture. Any use of analogy to Aztecs based on ethnographic information must first assess the validity of the Spanish interpretation of Aztec culture. This has not been done in mural studies, and is generally lacking in studies of precolumbian art. I find that Acostas (1964:48) warning, that it is very easy to give a seemingly normal and believable explanation to the mural art, even if that interpretation has no scientific basis, best characterizes mural interpretation. In particular, religious interpretations may seem logical, especially to researchers whose traditions include a cultural heritage in which religion remains significant. However, from a scientific perspective, evidence is required for any interpretation, no matter how seemingly plausible or logical. I also find that there has been a degree of acceptance of previous authors works without the aforementioned scientific criterion. Hence, the religious interpretation has evolved into a more complex and defined view, a reconstructed prehistoric religious world view, without sufficient evidence to accept the underlying and unstated assumption that the theme is religious, not to mention the evidence needed to understand such detailed ideation as personalities or manifestations of deities. An objective, primary level of study has been ignored while secondary, subjective levels of interpretation are dominant in the literature. In my view, some interpretations have reached the point where the researchers seemingly read the collective mind of a prehistoric culture. Ironically, at the same time archaeologists lament how little is understood about Teotihuacan. 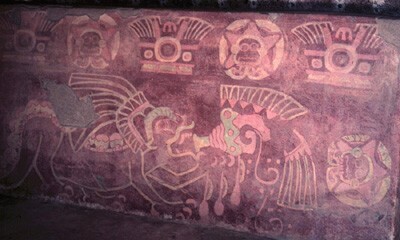 In past mural studies, scientific evidence to support the religious interpretation of Teotihuacan mural art is lacking. A reassessment of current assumptions about symbolism at Teotihuacan is needed. Future studies need to clearly state what their assumptions are, and the evidenciary or theoretical basis of those assumptions. Mural interpretations need to be founded on scientific evidence, particularly so when they are integrated into a presumed-to-be scientific understanding of Teotihuacan society. Acosta, Jorge R. 1964 El Palacio de Quetzalpaplotl. Instituto Nacional de Antropología e Historia, Mexico City. Angulo Villaseñor, Jorge 1996 Teotihuacán. Aspectos de la Cultura a Través de su Expresión Pictórico. In La Pintura Mural Prehispánica: I, Teotihuacán, Tomo II: Estudios. Edited by Beatriz de la Fuente, pp. 65-196. Instituto Nacional de Antropología e Historia, Mexico City. Barthel, Thomas S. 1982 Veritable "Texts" in Teotihuacan Art? Masterkey 56(1):4-12. Berlo, Janet Catherine 1992 Icons and Ideologies at Teotihuacan: The Great Goddess Reconsidered. In Art, Ideology and the City of Teotihuacan. Edited by J. C. Berlo, pp. 129-168. Dumbarton Oaks, Washington, D.C.
Cabrera Castro, Rubén 1992 A Survey of Recently Excavated Murals at Teotihuacan. In Art, Ideology and the City of Teotihuacan. Edited by J. C. Berlo, pp. 113-128. Dumbarton Oaks, Washington, D.C.
Cabrera Castro, Rubén 1995a La Cronología de los murales de Atetelco. In La Pintura Mural Prehispánica en México I: Teotihuacan. Tomo I. Edited by Beatriz de la Fuente, pp. xxvii-xxviii. Universidad Nacional Autónoma de México, Mexico. Cabrera Castro, Rubén 1995b Catálogo. In La Pintura Mural Prehispánica en México I: Teotihuacan. Tomo I. Edited by Beatriz de la Fuente, pp. xxvii-xxviii. Universidad Nacional Autónoma de México, Mexico. Cabrera Castro, Rubén 1995c Conjunto del Sol. In La Pintura Mural Prehispánica en México I: Teotihuacan. Tomo I. Edited by Beatriz de la Fuente, pp. 59-80. Universidad Nacional Autónoma de México, Mexico. Cabrera Castro, Rubén 1995d Conjunto Plaza Oeste. In La Pintura Mural Prehispánica en México I: Teotihuacan. Tomo I. Edited by Beatriz de la Fuente, pp. 45-58. Universidad Nacional Autónoma de México, Mexico. Cabrera Castro, Rubén 1995e Teopancaxco Casa Barrios o del Alfarero. In La Pintura Mural Prehispánica en México I: Teotihuacan. Tomo I. Edited by Beatriz de la Fuente, pp. 157-161. Universidad Nacional Autónoma de México, Mexico. Cabrera Castro, Rubén, Saburo Sugiyama and George L. Cowgill 1991 The Temple of Quetzalcoatl Project at Teotihuacan. Ancient Mesoamerica 2:77-92. Caso, Alfonso 1937 ¿Tenían los teotihuanacos conocimientos del Tonalpohualli? El Mexico Antiguo 4(1-2):131-143. Caso, Alfonso 1942 El paraiso terrenal en Teotihuacan. Cuadernos Americanos 1(6):127-136. Caso, Alfonso 1958-59 Glifos Teotihuacanos. Revista Mexicana de Estudios Antropológicas 15:51-70. Caso, Alfonso 1961 El Glifo "Ojo de Reptil." Ethnos 26(4):167-171. Caso, Alfonso 1966 Dioses y Signos Teotihuacanos. In Teotihuacan: XI Mesa Redonda, pp. 249-279. Sociedad Mexicana de Antropología, Mexico City. Caso, Alfonso 1967 Los calendarios Prehispánicos. Universidad Nacional Autónoma de México, Mexico. Cowgill, George L. 1992 Teotihuacan Glyphs and Imagery in the Light of Some Early Colonial Texts. In Art, Ideology and the City of Teotihuacan. Edited by J. C. Berlo, pp.231-246. Dumbarton Oaks, Washington, D.C.
Fuente, Beatriz de la 1995a Tepantitla. In La Pintura Mural Prehispánica en México I: Teotihuacan. Tomo I. Edited by Beatriz de la Fuente, pp. 139-155. Universidad Nacional Autónoma de México, Mexico. Fuente, Beatriz de la 1995b Zona 2 Templo de la Agricultura. In La Pintura Mural Prehispánica en México I: Teotihuacan. Tomo I. Edited by Beatriz de la Fuente, pp. 103-108. Universidad Nacional Autónoma de México, Mexico. Fuente, Beatriz de la 1996 Bibliohemerografía. In La Pintura Mural Prehispánica en México I: Teotihuacan. Tomo II Estudios. Edited by Beatriz de la Fuente, pp. 479-506. Universidad Nacional Autónoma de México, Mexico. Furst, Peter 1974 Morning Glory and Mother Goddess at Tepantitla, Teotiuancan: Iconography and Analogy in Pre-Columbian Art. In Mesoamerican Archaeology: New Approaches. Edited by Norman Hammond, pp. 187-215. University of Texas Press, Austin. Kubler, George 1967 The Iconography of the Art of Teotihuacan. Dumbarton Oaks, Washington, D.C.
LaGamma, Alisa 1991 A Visual sonata at Teotihuacan. Ancient Mesoamerican 2(2):275-284. Langley, James C. 1986 Symbolic Notation at Teotihuacan: Elements of Writing in a Mesoamerican of the Classic Period. International Series 313. British Archaeological Reports, Oxford. Langley, James C. 1991 The Forms and Usage of Notation at Teotihuacan. Ancient Mesoamerican 2(2):285-298. Langley, James C. 1992 Teotihuacan Sign Clusters: Emblem or Articulation? In Art, Ideology and the City of Teotihuacan. Edited by Janet Catherine Berlo, pp. 247-280. Dumbarton Oaks, Washington, D.C.
Langley, James C. 1993 Symbols, Signs, and Writing Systems. In Teotihuacan: Art from the City of the Gods. Edited by Kathleen Berrin and Esther Pasztory, pp. 128-139. Thames and Hudson, New York. Littmann, Edwin R. 1973 The Physical Aspects of Some Teotihuacán Murals. 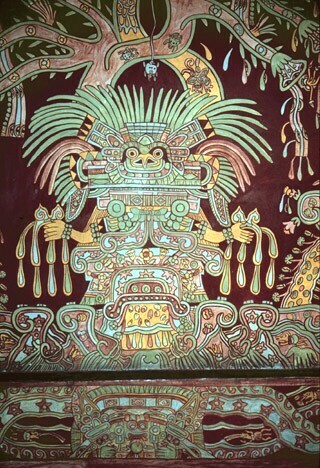 In The Mural Painting of Teotihuacan. Edited by Arthur G. Miller, pp.175-189. Dumbarton Oaks, Washington, D.C.
Lombardo de Ruiz, Sonia	1996 El Estilo Teotihuacano en la Pintura Mural. In La Pintura Mural Prehispánica en México I: Teotihuacan. Tomo II. Edited by Beatriz de la Fuente, pp. 3-64. Universidad Nacional Autónoma de México, Mexico. López Austin, Alfredo, Leonardo López Luján, and Saburo Sugiyama 1991 The Temple of Quetzalcoatl at Teotihuacan: Its Possible Ideological Significance. Ancient Mesoamerican 2(1):93-105. Miller, Arthur G. 1973 The Mural Painting of Teotihuacan. Dumbarton Oaks, Washington, D.C.
Millon, Clara 1972 The History of Mural Art at Teotihuacan. In Teotihuacan, XI Mesa Redonda. pp. 1-16. Sociedad Mexicana de Antropología, Mexico City. Millon, Clara 1973 Painting, Writing, and Polity in Teotihuacan, Mexico. American Antiquity 38(3):294-314. Millon, Clara 1988 Great Goddess Fragment. In Feathered Serpents and Flowering Trees: Reconstructing the Murals of Teotihuacan. Edited by Kathleen Berrin, pp. 226-228. The Fine Arts Museums of San Francisco, San Francisco. Millon, René 1992 Teotihuacan Studies: From 1950 to 1990 and Beyond. In Art, Ideology and the City of Teotihuacan. Edited by Janet Catherine Berlo, pp. 339-429. Dumbarton Oaks, Washington, D.C.
Morelos García, N. 1991 Municipalidad en la representacíon de felinos; y a propósito de los análisis de pintura mural y escultura, la critica. In Teotihuacan 1980-1982: Nuevas interpretaciones. Edited by Rubén Cabrera Castro, Ignacio Rodríguez García, and Noel Morelos García, pp. 233-257. Instituto Nacional de Antropología e Historia, Mexico City. Ostrowitz, Judith 1991 Second Nature: Concentric structures and gravity as represented in Teotihuacan art. Ancient Mesoamerican 2(2):263-274. Pasztory, Esther 1976 The Murals of Tepantitla, Teotihuacan. Garland Publishing, NY. Pasztory, Esther 1988 A Reinterpretation of Teotihuacan and its Mural Painting Tradition. In Feathered Serpents and Flowering Trees: Reconstructing the Murals of Teotihuacan. Edited by Kathleen Berrin, pp. 45-77. The Fine Arts Museums of San Francisco, San Francisco. Pasztory, Esther 1991 Strategies of Organization in Teotihuacan Art. Ancient Mesoamerican 2(2):247-248. Pasztory, Esther 1992 The Natural World as Civic Metaphor at Teotihuacan. In Ancient Americas: Art from Sacred Landscapes. Edited by Richard F. Townsend, pp. 135-146. The Art Institute of Chicago. Séjourné, Laurette 1959 Un Palacio en la Ciudad de los Dioses (Teotihuacan). Instituto Nacional de Antropología e Historia, México. Séjourné, Laurette 1966 Architectura y pintura en Teotihuacan. Siglo Ventiuno, México, D.F. Villagra Caleti, Augustín 1951 La pinturas de Atetelco en Teotihuacan. Cuadernos Americanos 10(6):1543-162. Von Winning, Hasso 1987 La iconogafía de Teotihuacan: Los dioses y los signos, 2 vols. Universidad Nacional Autónoma de México, Mexico. Published online Feb. 7, 2002. © 1998-2002 by James Q. Jacobs. All rights reserved.